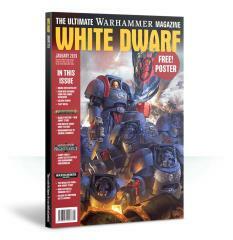 #29 "Deadly Venture, Children of Chaos Army Feature, Aeldari vs Imperium Battle Report"
White Dwarf is Games Workshop’s premium Warhammer magazine and starting this January, it gets even better. Every month it will be packed full of amazing content that will bring your hobby to life like never before. Within its pages you’ll discover new rules and background information for the armies of the 41st Millennium, the Mortal Realms and more, alongside short stories written especially for the magazine. You’ll also find regular columns that will give you unique insight into the inner workings of the hobby, and articles featuring some very special guests and beautifully painted miniatures as well. Deadly Venture: A new short story featuring the Kharadron Overlords. Blood on the Streets: John Bracken presents the new and updated rules for Warhammer Age of Sigmar: Skirmish. The Realm of Fire: The first in a new series of modelling and painting guides for the Mortal Realms. This month: Aqshy! Children of Chaos: We present an incredible army of Skaven and Maggotkin of Nurgle painted by Adam Elford. Glory Points: Warhammer Underworlds aficionado David Sanders investigates the different game boards in his new regular column. Mercenaries for Hire: Exclusive rules for using Kroot in Warhammer 40,000: Kill Team! Art of Exploration: Illustrator Paul Dainton explores the art of Blackstone Fortress. The Pinnacle of Painting: Guest columnist Darren Latham joins us to chat about entering Golden Demon. Golden Demon 2018: We show off eight pages of the very best entries from last year’s Forge World Open Day, including models from the Warhammer 40,000 Vehicles category as well as The Lord of the Rings and The Hobbit. ’Eavy Metal Challenge: Five of the best painters in the world compete in a wizardly challenge. The Herald of Doom: Darkness comes to Vigilus in this new short story by Nick Horth. Echoes from the Warp: Rule writer Robin Cruddace explores the genesis of the latest edition of Warhammer 40,000. (The long-awaited return of…) Index Astartes: Crimson Fists: New background and rules for this iconic successor Chapter of the Imperial Fists. The New Sons of Dorn: We take a closer look at Dan Hyams’ Crimson Fists Space Marine army. Battle Report: Decapitation Strike: Two top tournament gamers knock seven bells out of each other in this Aeldari versus Imperium matched play battle report! In the Studio: What have the Design Studio’s hobbyists been up to this month?